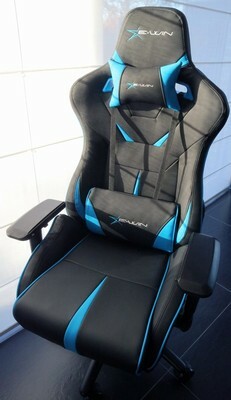 Review of the Ewin Racing Flash gaming chair. Most people reading this will likely be in front of the screen many hours a week and likely even multiple hours every day so it's a good idea to invest in a decent chair to complete your gaming setup. Besides higher comfort, more functionality and a better look, gaming chairs like the one we'll discuss in this review will likely stand wear-and-tear better than the el cheapo alternatives. Ewin Racing Flash Gaming Chair kaufen.